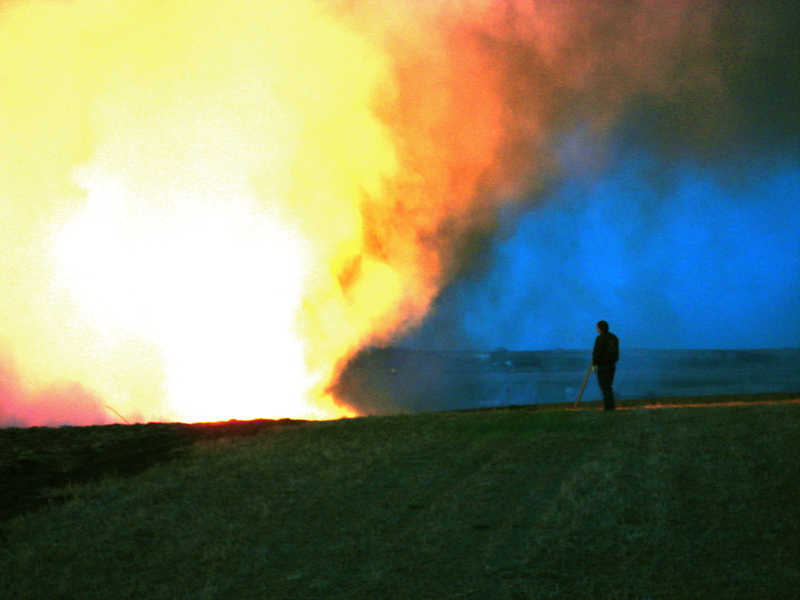 Cracked Ice and Chrome · And the prairie burned . . .
And the prairie burned . . . Remember that last post when I whined about how busy I was? Yeah, I’m still in that frame of mind. The spring semester is always busy, but it seems especially crushing this year, for reasons I haven’t quite determined. I think it has something to do with going paperless in composition this year with Google Docs. Yes, it makes things easier because the papers are portable, but I spend a lot more time grading things because it’s so easy to highlight and make comments without trying to squeeze it all in between margins. More time spent grading = good feedback for my students, I know, but the clock and calendar have not cooperated by giving me any more time to catch up on my other obligations, i.e. things I like to do to unwind. This blog counts as one of them. 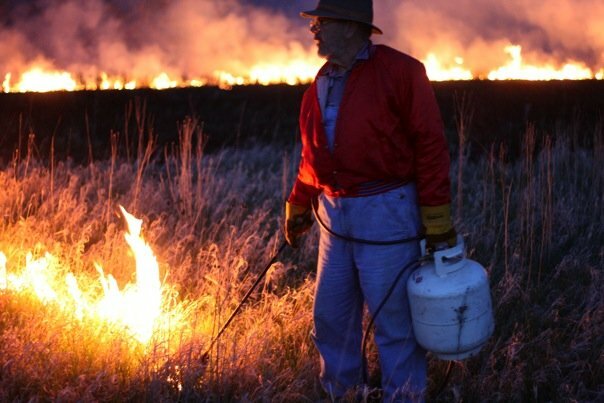 Anyway, this weekend I partook in an annual family tradition back in South Dakota: the prairie burn. My parents live on the family land which was homesteaded in 1872, so there’s a lot of history and a lot of beautiful prairie land that goes along with it. In truth, the prairie was in pretty bad shape when my parents built a house there in the mid-80’s. Cattle grazing on those rolling hills had pretty much obliterated the natural prairie, and it has been a 20-year project (at least) to restore the grasslands to their former beauty. 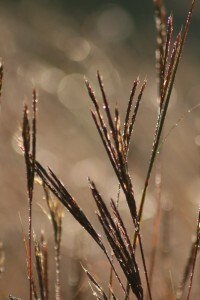 Have you ever seen a tuft of Big Bluestem grass? It’s beautiful at all times, but in the fall it takes on a deep burgundy tinge, and the effect in the early morning sunlight is striking. We’ve been unusually lucky the past few years, enjoying beautiful weather on “prairie burn weekend” in order to get the job done. This year, however, was a different story. On Friday, it rained, then we were greeted on Saturday with great gusts of wind accompanied by an official “high wind warning” from the National Weather Service. Do you think this stopped my father from burning? Of course not. 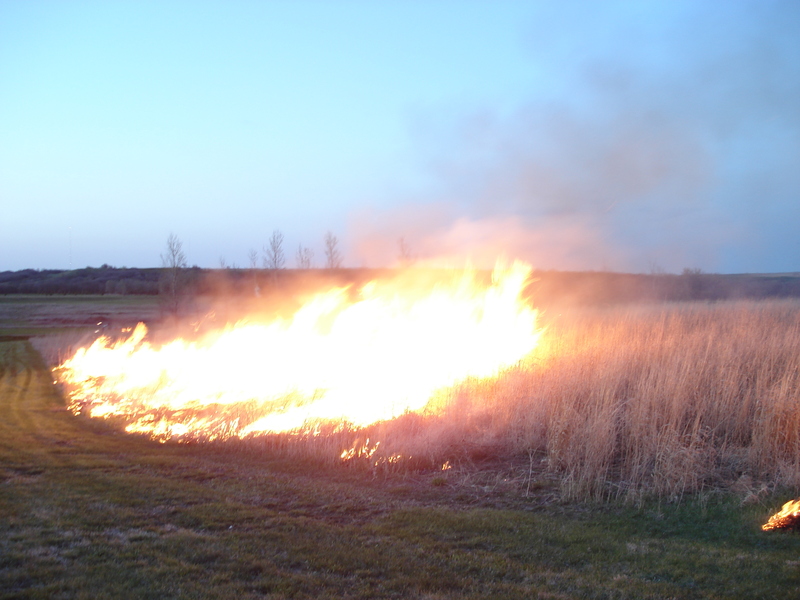 Now, before you go thinking that my family is full of pyromaniacs with bad judgment, which is only partly true (we pyros tend to have pretty good judgment, actually), you have to realize the official method of prairie burning that has been perfected over the years. My father has mowed “paths” through the prairie that have a dual purpose. 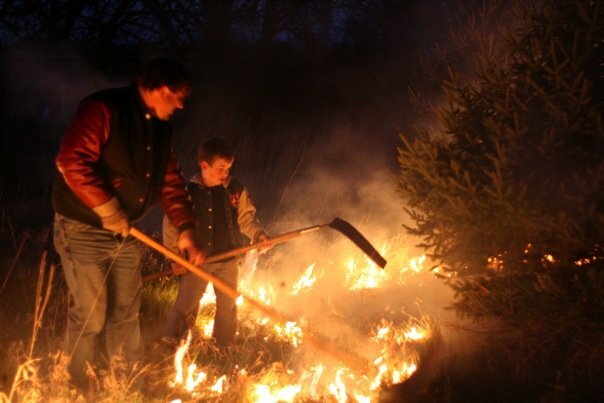 They’re used for driving on, of course, but they’re also used as firebreaks during “the burn.” Dad always does a “back burn” first to ensure that the fire really has nowhere to go. Once it hits the path, it usually goes out. If it doesn’t, that’s where the “flappers” come in, which are flaps of rubber attached to a handle, so that snuffing out any wayward flames is fast and easy. Wind warning or not, the burn was going to occur, and it did. 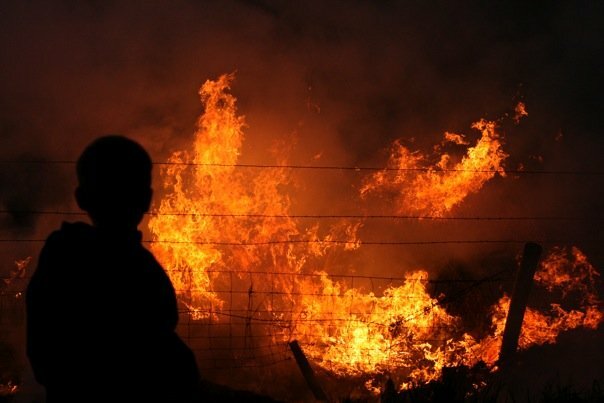 The flames danced across the prairie, fueled by the dry grass and the ferocious wind. Smoke raced horizontally over the grass, heading for the river basin, where it would crate a hazy smog for hours. There’s nothing quite like seeing a prairie burn, so if you ever have the chance to see one, GO. The downside of having a burn in a windstorm, however, is that lugging my camera around got old really fast. Truthfully, pictures wouldn’t have been that interesting and video would have been impossible due to the roaring wind, so I only took a couple not so good shots. We’ve been doing the burn for 25 years now, however, so I have a whole stash of good pics to resort to. 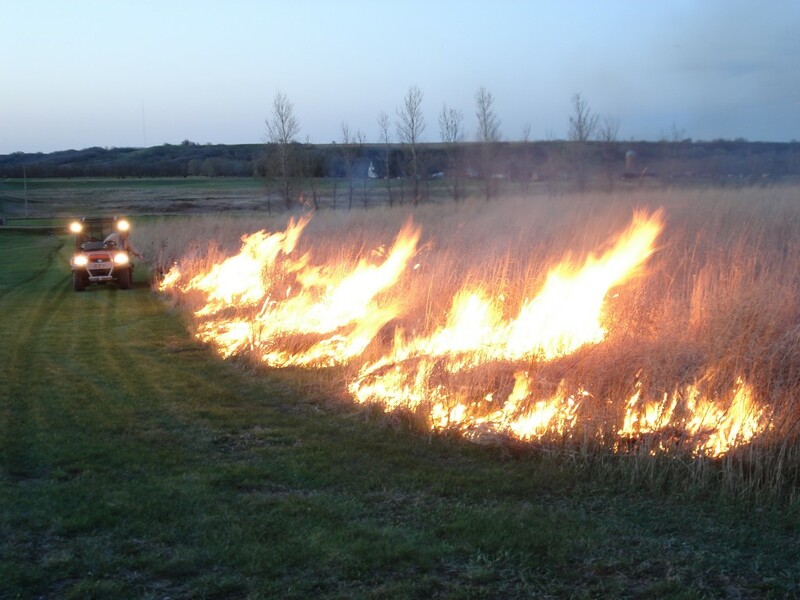 We try to save the good burns for nighttime, particularly the patches that have nicely restored prairie grass, such as this parcel. The burn always starts this way, with Dad using the propane torch to light a line of fire. As you can imagine, it has the tendency to take off in a flash on a patch like this. The visuals are amazing. I took this a few years ago with a cheap Kodak digital point and shoot that I had. The actual flames were not that big, but the camera’s lack of ability to handle the dark and the light ended up making this scene look like a nuclear bomb went off. The night burns are the greatest, and last year I was able to capture a lot of neatly lit shots. HA HA! Just a tiny joke. Please put the phone down. If you’ve ever wondered what Hell is like, I think this might be a pretty good indication.